Russia still refuse to reveal how many drugs tests they have undergone since the World Cup began - after being joined in doing so by England. 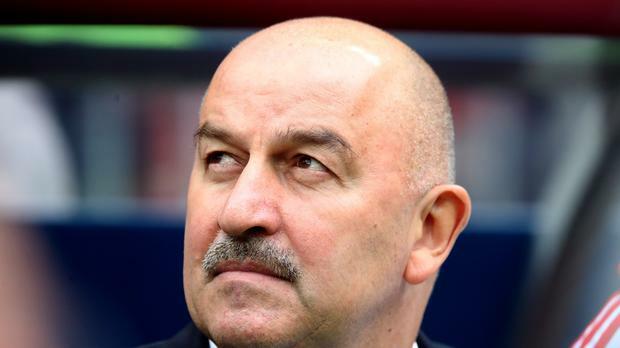 Stanislav Cherchesov, the manager of the host nation, snubbed questions about his side's testing record ahead of their final Group A game against Uruguay today. The Football Association also refused to reveal whether England had undergone any drugs tests beyond those conducted on two players after every match. The FA were asked after Eduard Bezuglov, Russia's team doctor, last week bristled at questions about doping checks at the World Cup, declaring: "We'd also like to know how many probes the English gave." The same information was also sought from every other country at the tournament. Egypt, Croatia, Iceland, Mexico, Poland and Serbia all confirmed their players had undergone no additional tests. Portugal declined to comment, although it is understood they, too, had been subjected to no supplementary testing. Russia and England were joined by Costa Rica - infuriated at the last World Cup when seven of their side were tested after their win over Italy - in refusing to disclose any details of sample collections carried out. "Is this a question about the match or philosophy? I am not a doctor. We are talking about the match," Cherchesov said yesterday. FIFA refused to reveal how many samples it had collected from Cherchesov's men since the World Cup began. That was after Russia produced the best ever start by a host nation, beating Saudi Arabia and Egypt by an aggregate score of 8-1. Official FIFA statistics also showed their players had run further and faster than any other side at the World Cup. "If nobody has noticed anything but the runs and sprints, we will have to add something else, and that we will do. That's the first thing," Cherchesov added. "Secondly, those who know what physiology is, we went through the Confederations Cup and the condition of the national team then was very good. We introduced some corrections, we addressed our problems, and that's why the team looks even better." Fifa has repeatedly described Russia as "one of the most tested teams prior to the 2018 Fifa World Cup". According to documents, Russia's 23-man squad was tested by the Russian Anti-Doping Agency (RUSADA) 88 times between January and May. RUSADA was suspended by the World Anti-Doping Agency in 2015 after an independent report found its employees gave advance notice of tests to athletes and "routinely" took bribes to cover-up doping. It was banned from carrying out tests until last year, when its suspension was partially lifted under supervision from Wada-appointed international experts and UK Anti-Doping. FIFA, however, barred Russia from any involvement in the World Cup anti-doping process.